A young baby suffered broken bones in the care of relatives after failings by agencies - including the council at the centre of the "Baby P" scandal. Doctors found the 11-week old, known as "Baby D", had a fractured arm and possibly several old rib fractures. The family had "a history of violence" and were known to Haringey children's services, which admitted more could have been done to protect the child. A serious case review said risk factors were not taken seriously enough. Sir Paul Ennals, chair of the Haringey Local Safeguarding Children Board, said: "Collectively, we sincerely regret that there were several areas where we could, and should, have done better. "With hindsight, there were many episodes during D's first three months, and earlier during the child's mother's pregnancy, when front-line staff could have acted differently. "We cannot say that if they had done so, the abuse would not have happened. But we can say that many of our agencies could and should have responded differently." The report found the child's mother was herself vulnerable, having been taken into care after suffering neglect and violence. She was 17 when she became pregnant and the father was 34. The baby also lived with its grandfather and a 14-year-old uncle, both of whom had a history of violence and criminal behaviour. Although the baby's family was suspected of being involved with gangs and drug-related activity, social workers failed to take these risk factors "seriously enough," a serious case review (SCR) found. It found that "a culture of meeting targets and timescales had resulted in a lack of critical analysis when conducting assessments". Baby D was seen by hospital doctors on 29 April, 2013 and the possible rib fractures are believed to date to when the baby was one month old. The baby was taken into care and the parents were arrested over the suspected abuse or neglect, but the criminal case was dropped because of problems with the key witness. 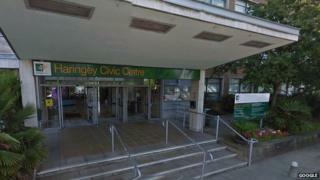 A council spokeswoman said Haringey social services had accepted the findings of the SCR and was "pleased" to have found the child a successful care placement. NHS England said: "There's no question more should have been done by the NHS in London to protect this child's health and safety and prevent these awful injuries." "New six to eight week birth checks are now a mandatory part of safeguarding training for all GPs and nurses in Haringey. We are committed to protecting the welfare of our patients." Haringey social services was severely criticised in 2010 for its failures to protect Peter Connolly, known as Baby P, who died in 2007 aged 17 months, after he suffered more than 50 injuries. The council has since been criticised for failings in 2010 and 2011 relating to Child T, who suffered horrific abuse by his parents and was once found to have had more than 50 bruises on his body.